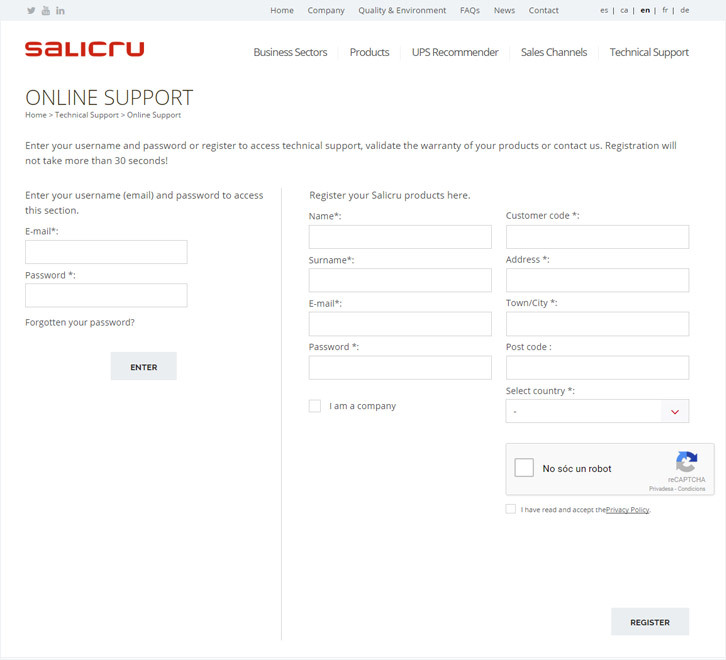 If you need to report any incidents with your SALICRU devices, go to our Online Support (link), register your product and report the incident - as easy as that. Below, we explain the different ways we can help you resolve incidents and provide you with information about warranties and their general terms and conditions. If the device is from the SLC TWIN PRO2 / SLC TWIN RT2 series and has a power equal to or more than 4,000 VA, our technical service department will contact you to coordinate the resolution of the incident. If the device is out of warranty, our technical service department will contact you with information about the out-of-warranty repair plans we offer. For all other cases, we will replace the device within a maximum of 48/72 hours in mainland Spain and the Balearic Islands (7-10 days in the Canary Islands), except bank holidays. It is important to have the faulty device ready to be picked up by the courier company. Consult your local distributor for warranty terms and conditions. Spain and Portugal: For devices installed in these countries, SALICRU offers an IN-WARRANTY EXCHANGE service whereby we will immediately replace the faulty unit with another device of the same model. Rest of the world: Consult your local distributor for warranty terms and conditions. Spain and Portugal: For devices installed in these countries, the warranty includes free repair at Salicru for any fault attributable to the manufacture of the device. Transportation and packaging costs are borne by the customer. If a visit by a technician is required, the warranty covers materials, labour and travel between the hours of 9:00 am and 6:00 pm Monday to Thursday and 9:00 am to 2:00 pm on Fridays (except bank holidays). To learn how to register your product go to the Log tab where equipment has a brief explanation of how to do it. • The devices meet the quality standards indicated. • They are free from defects in design, manufacture and/or materials. • The warranty period is specified according to the series from the date of purchase. • In the event of fault or malfunction, the device shall be repaired or replaced, as deemed appropriate, without charge. This warranty only covers the original purchaser of the product, not second owners, regardless of whether they have paid for it or acquired it free of charge. Furthermore, this warranty shall only apply if the end user has scrupulously observed the safety and operating instructions defined by SALICRU. In none of the following circumstances shall SALICRU accept liability for faults with devices: (i) non-compliance with previously specified connection instructions; (ii) improper use; (iii) connections that are non-compliant with the ‘CE’ marking; (iv) connections linked together with other UPS systems, power terminals, surge protectors or extension cords; (v) electrical wiring that is non-compliant with technical regulations; (vi) manipulation of devices not authorised by SALICRU; (vii) faults caused by external factors, such as fire, explosion, lightning, water damage, theft, vandalism, atmospheric phenomena, floods, earthquakes or terrorist acts; (viii) accidental or deliberate dropping or breaking of the device; and (ix) normal wear of the device. SALICRU shall not, under any circumstances or for any reason, accept liable under the terms of this warranty for direct or indirect losses, such as loss of business, loss of profit, loss of services, software or information, damage to any non-hardware media, or damage to, or loss of, any kind of property. This warranty is subject to the national laws of the country where the device is used. If any clause of this warranty is determined to be invalid or unenforceable in whole or in part by any competent authority, the validity of the remaining clauses and the rest of the clause in question shall not be affected. For more information about Salicru’s different kinds of extended warranty, please contact sst@salicru.com or telephone 902 48 24 01 (Spain only) or +34 938 482 400 (rest of the world). Registering your product at Support Online you will have access to an interactive on-line space conceived for our customers to consult information on the equipment they have purchased, download the software updates for our equipment or perform processes such as management of incidents, requests for trainning courses, and on-line chat with our Service and Technical Support for immediate resolution of all technical doubts. 1. Sign up in the Online Support. 2. 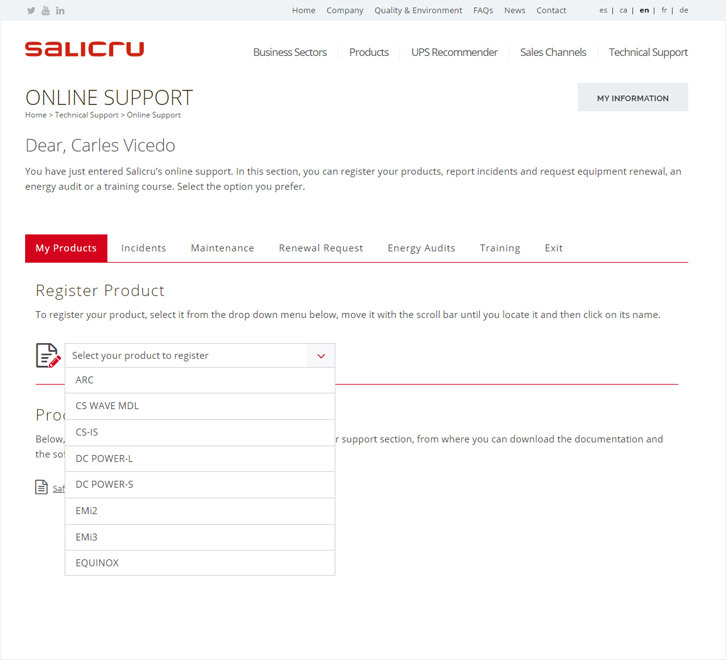 Register your products Salicru. 3. Registered to report any incidence Products. The warranty does not cover any compensation for damages or losses under any circumstance. Salicru is not responsible for the incorrect use or unauthorized handling of our equipment. 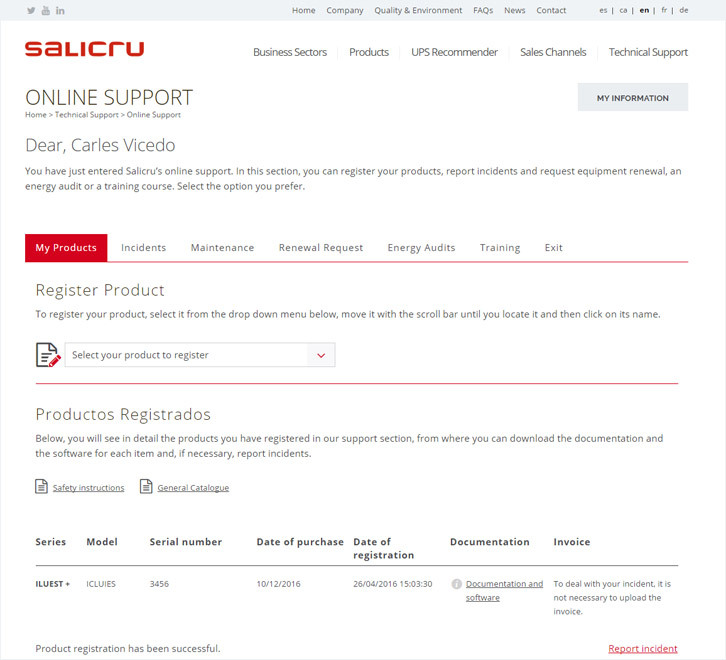 Please fill in the warranty registration information in support.salicru.com. Salicru has various types of extended warranties available. For more information, please write to sst@salicru.com or call +34 938 482 400. 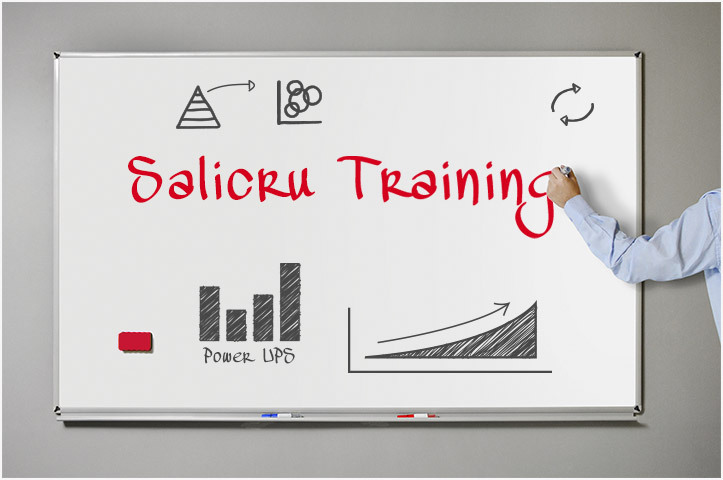 Salicru offers his long experience of 50 years in the field of power electronics, an industry constantly evolving. Therefore, the courses are ideal for those who do not have knowledge specified in such products as well as for those who need to renovate or upgrade. Electronic and Servomotor Stabilizers: 2 days. Three Phase UPS. 3 days. Ligthing-Flow Dimmer Stabilizers ILUEST+: 2 days. A complete documentation pack is given on each training session for the follow-up of the course. The bringing forward reservation has to be done 30 natural days as minimum. Salicru reserves to cancel the course in case there is not a minimum attendance. The courses will be done in our headquarters facilities. Training courses at site can be given under request. Consult the specific conditions of each course. To make the query should be directed to our Online Support, select your teams, and contact us.